The Perils of Delivering Big Cakes! So as you can tell from the title of this post that I had some trouble with a big cake. Well I did indeed have some trouble. That is the problem when you run a business by yourself for the most part, you don't always have the help in the form that you want or need it in. So this past Saturday I had to deliver the biggest wedding cake to date, a four tier square cake covered in white fondant. Yes! White fondant! For those of you who don't understand the the problems with white fondant, let me just tell you this white fondant shows every little mark or dent or even lint that can be in the air..so I get a little paranoid when a client asks for a cake in white fondant. I have to use very clean gloves, wear short sleeve shirts and make sure that my working area is extra clean in order for the fondant not to pick anything up. 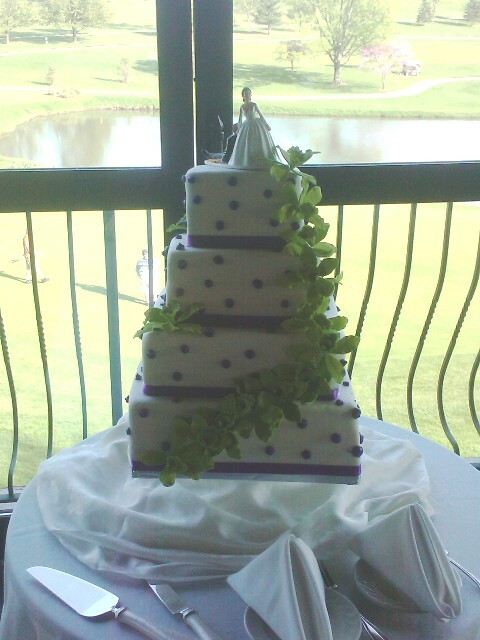 So I had to be extra careful with all 4 tiers. You can imagine my stress level over this cake. So because the hubby was unable to help me deliver the cake, I had to ask my best friend for some help. With a cake that big and heavy its hard to move by yourself. Once I got back home and looked at the pictures, I was proud that I was able to get it to look so nice even with all of the issues I had. Wedding season is great for business bad for the blood pressure. Any whooo here is the cake and some other back pictures that I haven't shown yet. Enjoy! 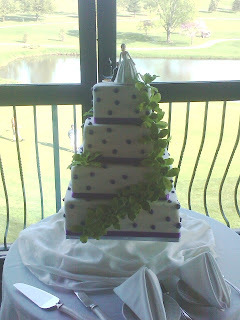 4 tier white wedding cake with purple buttercream dots and green orchids. 2 tiers are devil's food with butterfinger filling and the other 2 are vanilla with fresh raspberry filling. 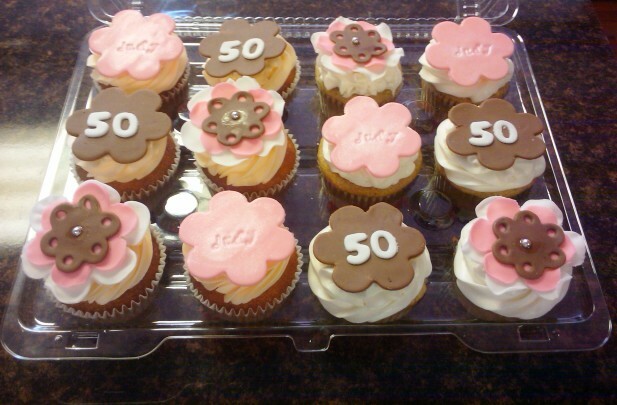 Delivered to Heritage Hills in York, PA.
50th Birthday Cupcakes- pumpkin spice, whopper, spiced apple, orange dreamsicle flavored cupcakes with the name and age of the birthday girl and pink/brown flowers. 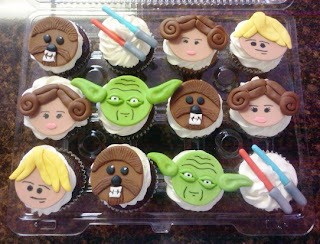 Star Wars Cupcakes- Oreo Overload, Chocolate, Red Velvet & French Vanilla flavored cupcakes. Toppers were based on some toppers that my client saw on another website. Gluten free & Diary Free Chocolate Cupcakes- I provide cakes and cupcakes to children and adults that have food allergies. 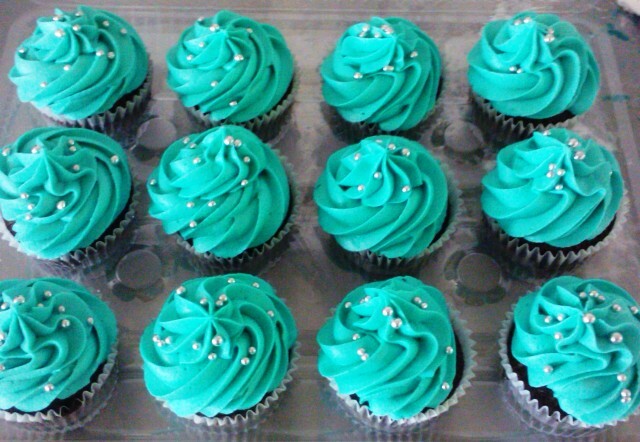 These are one of many orders I have done. Well my lesson was learned and if I can't get the hubby to help me deliver then I will just deliver myself. Oh and I am getting interns in about 2 weeks! I am soo excited to have the extra help.